>Thsi map is awsome! I know there are some misaligned textures and I tried to fix them when I dl this map but they're the ones that don't like to go together sometimes. 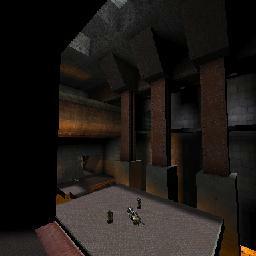 I don't know what else to say except dl this map now! A tight layout but it doesn't take anything away from the gameplay. Looks good too. This map is not bad, but I am not sure why it is getting such high scores when maps with more professional graphics and gameplay are getting less. Most of the lighting is not well sourced, and the architecture is very basic. While I like the overall connectivity of the map, too much of it is corridors, and there are some architectural elements that impede smooth movement. My favorite part of the map is the room with the flowing lava. It is a nice visual effect, and this room also shows more professional connectivity. Overall, I see potential here, but this map is still unrefined in terms of gameplay and visuals. Wow, im not sure about this one, i won't rate it, but the layout is really not doing it for me. Just take those random pillards in front of door frame, they are completely killing the map, same for the Narrrrow corridors near the flak pickup. and the colors/texture are very odd together. The mucis made me fart for a while. I really hate that epic UMX file. Im sorry but this is not a keeper for me.